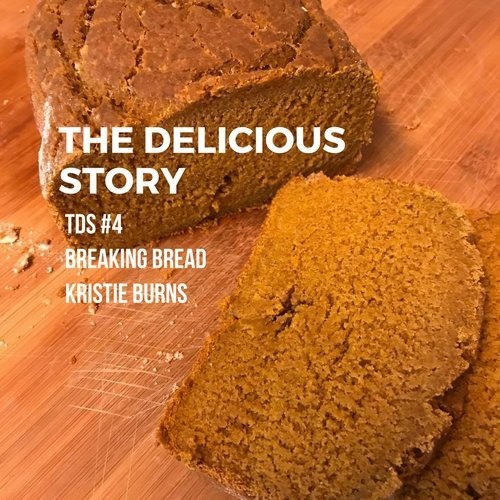 Listen to "TDS #4 Breaking Bread with Kristie Burns" on Spreaker. And there it is, just that substantial—the food that finishes out a meal so that we feel the full sense of bounty eating. In this episode of The Delicious Story, we visit with Kristie Burns who wears many professional hats, including teacher, naturopathic, photographer and bread connoisseur. We’ll wrap ourselves within the crisp, warm comfort of the lattermost subject, and take a mini-tour of some other cultures and their takes on bread. And if you’ve taken gluten off your plate, Kristie will also talk about her bread life after gluten. Sit back and break bread with us for this episode of The Delicious Story! SIFT TOGETHER ALL THE DRY INGREDIENTS. MAKE WELL IN DRY INGREDIENTS AND ADD OIL, EGGS, WATER AND PUMPKIN. MIX UNTIL SMOOTH. BAKE AT 350 DEGREES 1 HOUR. YIELD 3 LOAVES.